Plenty of events are organized in Australia throughout the year. Whether you like sport or boat races, gastronomy or tennis matches, you should find happiness in Australia! You will find below a list of the main Australian events, but many other festivals punctuate the year. Big Day Out: This rock festival successively takes place in Sydney, Melbourne, Adelaide and Perth. Tamworth Country Music Festival: It is one of the world's ten biggest country music festival! Australia Day: The 26th of January is Australia's National Day. BBQs, fireworks and concerts are organized all around the country. 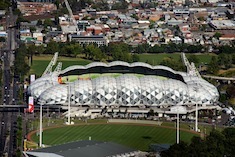 Australian Open: This major tennis tournament is held annually in Melbourne. Festival of Sails: Oldest sport event in Victoria, this sailing regatta attracts 300 yachts every year. Tropfest: Taking place in Sydney, Tropfest is one of the world's largest short film festival. Australia Open of Surfing: More than 125 000 gather on Manly Beach to watch this high level competition. Melbourne Food and Wine Festival: This is the perfect event to discover the Australian gastronomy! Formula 1 Australian Grand Prix: This competition is the first Formula 1 Grand Prix of the season. Sydney Gay and Lesbian Mardi Gras: Each year, more than 700 000 people gather in Oxford Street to attend the parade! WOMADelaide: This festival is dedicated to world music, cuisine and dance. Handa Opera on Sydney Harbour: During one month, opera shows are performed in the open. Melbourne International Comedy Festival: Laughter guaranteed! It is one of the third largest comedy festival in the world. Ten Days on the Island: Every 2 years, international and local artists present their work in atypical places of Tasmania. ANZAC Day: The 25th of April commemorates all Australians who served and died in wars and conflicts. 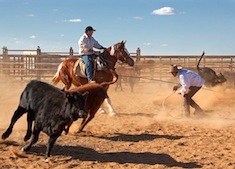 Sydney Royal Easter Show: During 2 weeks, "city meets country". Agricultural shows and horticultural displays are part of the program. VIVID Sydney: Australia's largest sound and light festival, it also encompasses debates. Laura Aboriginal Dance Festival: Every 2 years, Aboriginal communities gather in Laura to perform traditional dance and music shows. The Noosa Longweekend Festival: During 4 days, the best Australian chefs and winemakers display their dishes and products. Gold Coast Airport Marathon: Besides the full marathon, a half marathon and a 10kms race are organized. Adelaide Cabaret Festival: World's legends of cabaret gather in Adelaide to perform 30 different shows. The Rugby Championship: During this competition, Australia is opposed to the rugby teams of Argentina, New Zealand and South Africa. Barossa Gourmet Weekend: During 3 days, food and wine-tastings are organized in the famous Barossa Valley. Melbourne International Art Fair: The paintings, pictures and other artworks of 900 artists from all over the world are displayed. Cairns Festival: This eclectic art festival features both Aboriginal and Western shows and exhibitions. Australian Football League: In Melbourne, where the final takes place, streets take on a festive air! Brisbane Festival: During this large-scale art festival, shows are performed in the concert halls but also in the open. Jazz in the Vines: Music and dance meet gastronomy and wine in the famous Hunter Valley. Perth International Golf Championships: This renowned contest takes place on one of the world's ten best greens. Australian Motorcycle Grand Prix: Part of the Grand Prix motorcycle racing season, this race is run at Phillip Island. Feast Festival: Adelaide's lesbian and gay culture festival has become one of Australia's best festivals. Melbourne Cup: More than 100 000 people gather in Melbourne to watch this major horse race! Sydney - Hobart yacht race: The 26th of december, sailors leave Sydney Harbour. They reach Hobart just in time for celebrating New Year's Eve! Boxing Day Cricket Test: This major sport event takes place the day after Christmas in a friendly atmosphere. New Year's Eve: The New Year is celebrated on the beach. 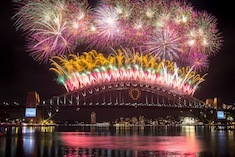 Festivities peak in Sydney where a spectacular firework is displayed.